Just finished listening to Social Media Examiner’s podcast about the Google AMP Project (accelerated mobile pages). The guest was Leslie Samuel of Become A Blogger podcast fame. 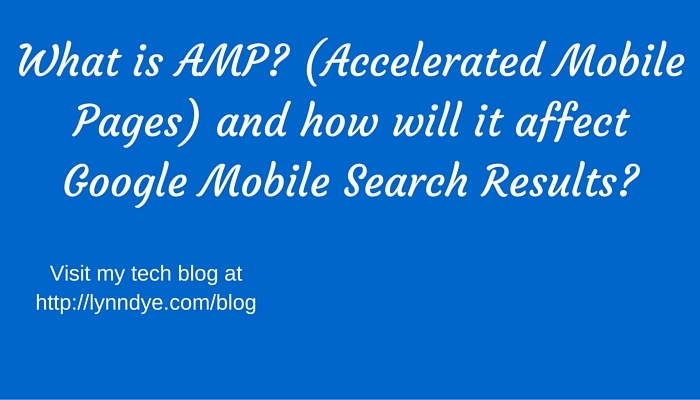 The Google AMP project was introduced last October. The goal is to speed up web pages loading on mobile devices. We’ve all been on our mobile device and wanted to quickly get to a website, but it took forever to load and we abandon the page. This project’s goal is to optimize websites to load in under 3 seconds. Although I’m calling it Google AMP, (it’s really the AMP Project), it’s actually a collaboration among many tech companies like Twitter, Facebook, Pinterest, WordPress.com, LinkedIn and more. The podcast and I are focusing on the Google aspect of the project since Google controls search. This project is open-source and is built on AMP HTML, “a new, open framework built entirely out of existing web technologies”. The podcast’s emphasis was how AMP would affect people like you and me, bloggers and people selling things from their website. Please visit the show notes from Google AMP with Leslie Samuel. The notes have screenshots and a great overview, but the reason I’m doing this post is to put some more detail around the Pros and Cons of the AMP Project. 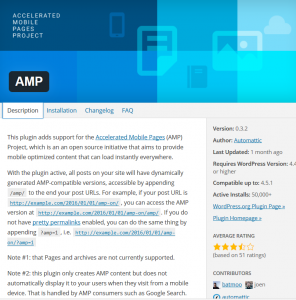 Since WordPress got on the AMP bandwagon first, there are already some good options for us. There are 2 free plugins in the repository to help sites painlessly adopt AMP. First, there’s the AMP plugin. This plugin will add an /amp ending onto your urls when people are on a mobile device. Then you’ll probably want to add the PageFrog plugin. It will help you add a bit of functionality back into your site. You can change colors along with some other design aspects. This plugin also will give you Google Analytics for AMP views. Your regular Google Analytics will not count people coming to your site when you have the AMP plugin installed. That’s why you need PageFrog. Yes, that’s another con, isn’t it? Now you know a little about the AMP project. You may have listened to the podcast too and are thinking what should you do with this information? You could add these plugins right now and be ahead of most people. But, you have to ask yourself if more traffic is worth perhaps losing sales, opt-ins and shares? Michael Stelzner said he is not ready to do that for Social Media Examiner. Right now, they are capturing about 4,000 email addresses a month via mobile pop-ups. He sells things on his site. It’s a no for him. 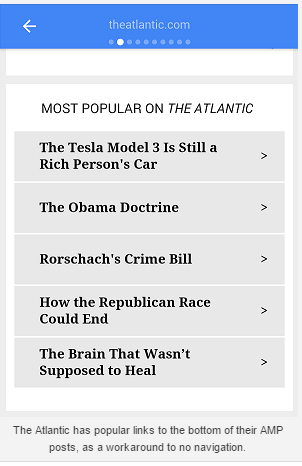 If you are curious as to what sites that are AMP’d look like – here is a snip from the Washington Post (borrowed from Social Media Examiner). Both Stelzner and Samuel believe this change is the biggest thing we’ve seen in the last 10 years and eventually they will have to adapt. Perhaps if smart-phone processors get faster, this change will not be long-lived. Samuels believes that the AMP project will continue to evolve and most likely more features will be added so sites aren’t so stripped down. What will you do? I still haven’t decided for my website. I’m not selling anything right now and I could put links at the bottom of each post/page that people can click on to get to the rest of my site. It wouldn’t be too much of a loss for me. Leave a comment with your thoughts about the AMP project.